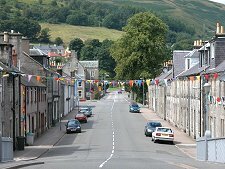 Langholm is surprisingly remote for such a significant town. 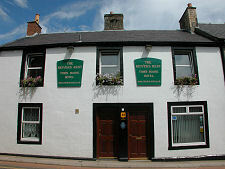 It is the first place of any size you pass through after crossing the Scottish border on the A7 from Carlisle to Edinburgh. And you are likely to notice it, not least because of the attractiveness of the setting and the tightness of the High Street as it squeezes past the side of the Town Hall. 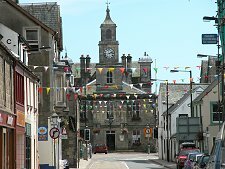 Although part of Dumfries and Galloway, Langholm feels to have much more in common with towns further up the A7 such as Hawick or Galashiels, towns built in valleys whose stories are closely linked with the rivers that flow through them. 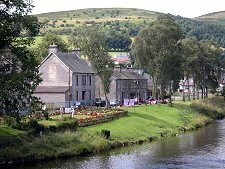 Langholm lies at the confluence of the River Esk and the Ewes Water. In the angle formed by the two, opposite the main car park and tourist information centre, are the fairly slight remains of Langholm Castle. This was built in the 1500s and became the seed that crystallised the growth of a settlement on the east side of the River Esk, around today's High Street. 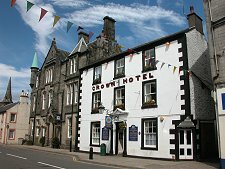 Amongst the early buildings was a second castle, a tower house later partly incorporated into a hotel development. For many years the only bridge across the River Esk lay the better part of a mile to the south of Langholm, at Skipper Bridge. This restricted the growth of the town to the east side of the river. 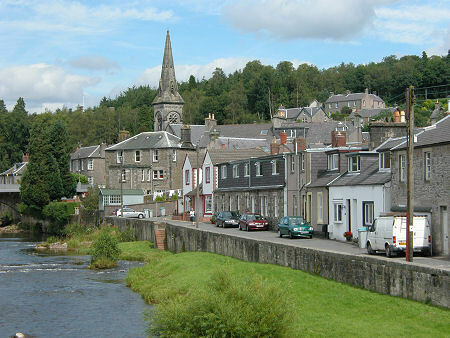 This all changed in 1788 when the Duke of Buccleuch founded what was originally called New Langholm as a grid-plan settlement on the west bank of the River Esk, connected to the existing town by a new bridge, Langholm Bridge. 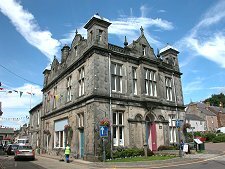 Today the main road running west from Langholm Bridge is called Thomas Telford Road, in memory of one of Langholm's most famous sons. 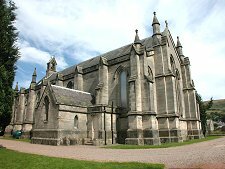 Thomas Telford was born nearby in 1757 and apprenticed in Langholm as a mason: before later going on to transform much of Scotland with his roads, canals, harbours and churches. Telford's local origins are remembered both in the name of a road and in the form of a small length of wall opposite the Old Library that backs onto the Town Hall. This wall was made as an apprentice-piece by Thomas Telford during his training in the town. The location is fitting as the library was originally endowed by Telford. 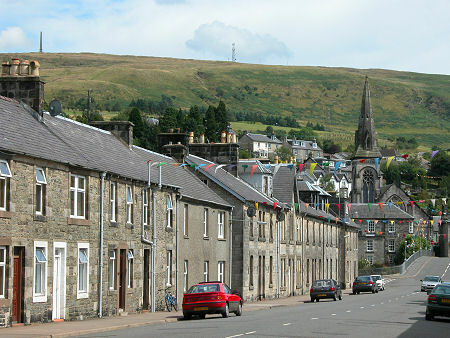 On the hillside overlooking Langholm to the east are two monuments. The obelisk of the Malcolm Monument, a memorial to Sir John Malcolm who died in 1833, can be seen in the top left of the photo below. 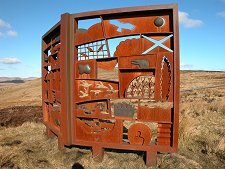 Nearby, but closer to the minor road from Langholm to Newcastleton, is the striking steel and bronze memorial to the poet Hugh MacDiarmid. 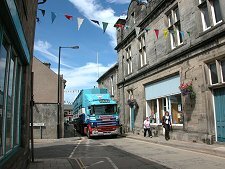 Langholm's story over the past three hundred years has been one of varying industrial fortunes, coupled with its role as an important rural centre. Woollen mills became a major feature of the town, and cotton manufacturing, two distilleries and a brewery all at various times played a part, though of these only the woollen industry retains a foothold.